This space represents what my facility is all about, therefore it will be one of two of my large perspectives in my presentation. 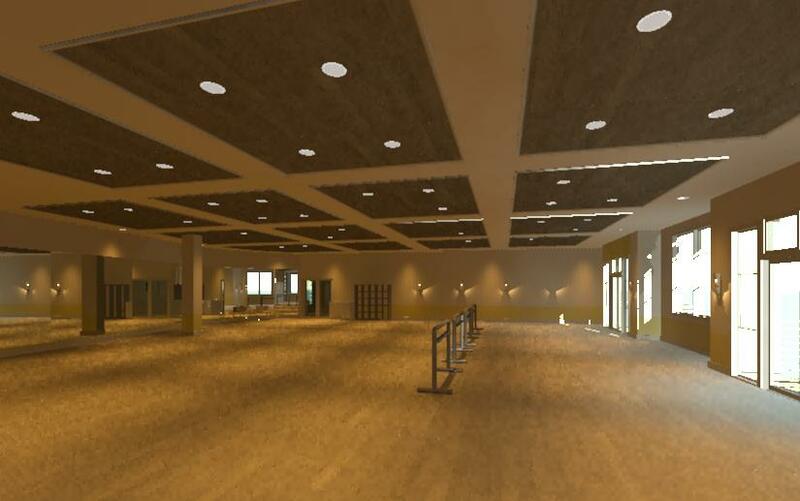 This is a practice rendering and draperies still have to be added. 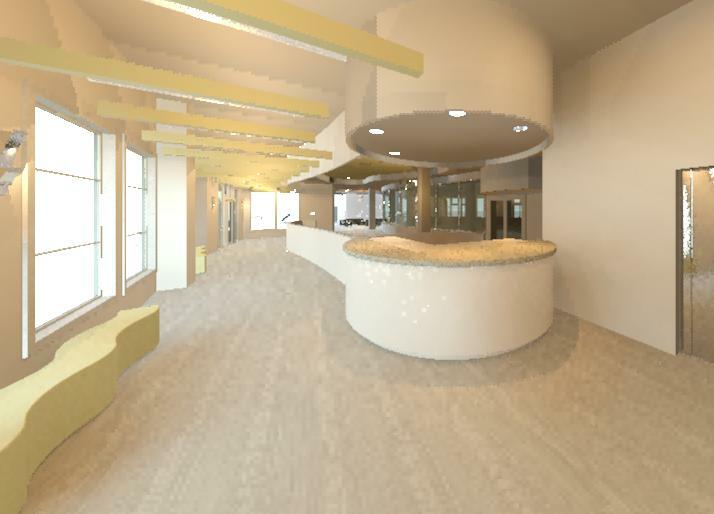 The space will be much brighter after being rendered in the cloud and photoshopped. This space shows what you see when you enter the academy on the most public floor. 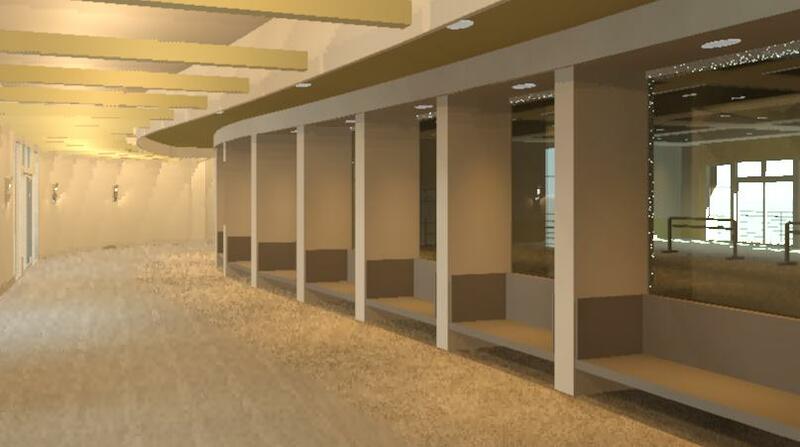 The final view will be slightly different, with sun shades added to the windows, base molding added to the walls and a soffit above the elevators with architectural lighting. I am currently working on the view beyond this space and making sure it is illuminated enough to be visible and understood. This space is integral to the concept of the dance academy in that it communicates movement which enhances the main concept of unity. 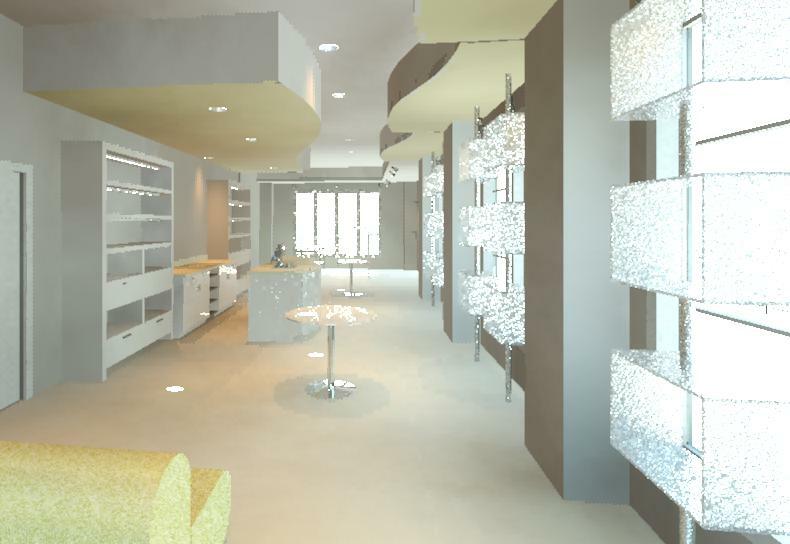 This image is rendered only on draft to determine what time of day allowed the space to show up the best. This gives you an idea of what is going on and objects will be inserted in using photoshop after it is rendered in the cloud. 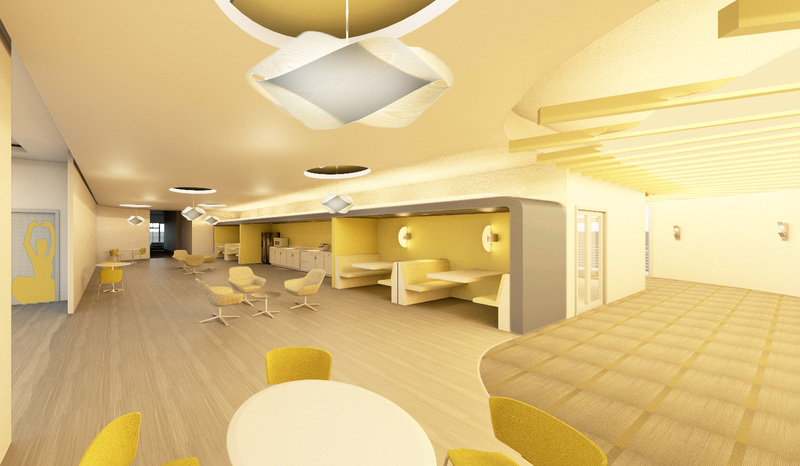 The circulation space will have tufted chartreuse seat cushions photoshopped in and will be lightened as well. This image is not from the cloud, but has been sent but not photoshopped just yet. The image will be lightened and accessories will be added using photoshop. 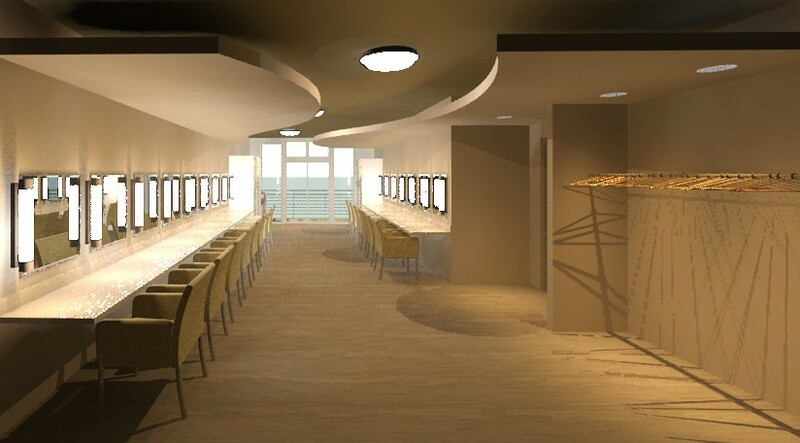 This is a draft rendering of the space where the dancer’s guardians and family members can come and watch their practices through closed circuit cameras in the studios. The image will be lightened in photoshop dramatically. 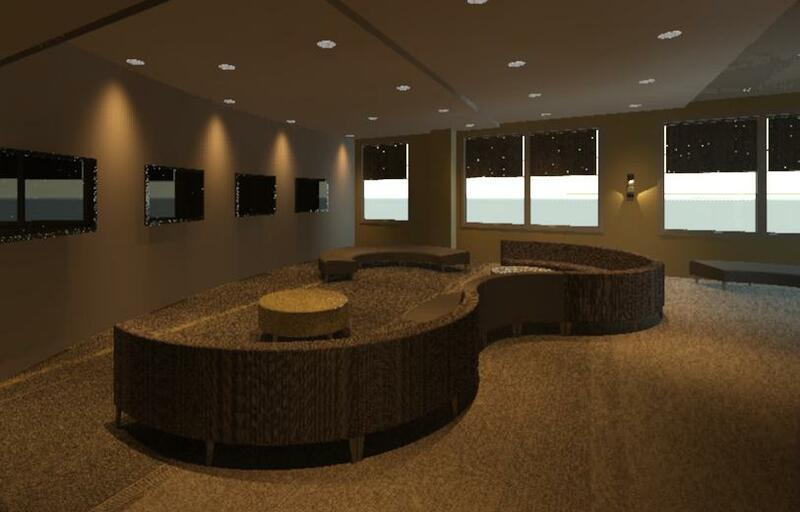 Check out that carpet pattern… it is from Shaw Contract Group. I am happy with how it turned out. This place makes me want to learn to dance! I know! I wish it was a real space. This makes me want to get into architecture….maybe in another life. Nice posts!